A Desolate, Boring, Confusing, Windy Wasteland !! I've encountered well over 150 courses in my 30 years of playing this frustratingly wonderful game, but nothing compares to this outstanding pile of grass cuttings, (being very polite), they call Sheerness Golf Club. I turned up on a very windy day with two of my friends, my actor buddy, John and Roy, my taxi partner in crime. We decided to get a coffee in the clubhouse to warm us up before hitting the bitterly cold fairways, only to find the bar was shut and the coffee had to be purchased from a machine. Bearing in mind it was nearly midday, this was very disappointing. Onto the game. It was an extremely tough round of golf in that wind, not the Club's fault, I hear you say, yes, you're right, but there were other things that could have made it easier and a lot more enjoyable. The lack of signage to the tees, probably cost us 500 yards in extra walking distance, also, the way the tees were set up, meant you couldn't distinguish which green you were playing to, especially if there were two flags in the distance. On one occasion on the back nine, we teed off in one direction, only to find the hole was 90 degrees to the right of us, needless to say, we were almost as far away on our second shots as we were on our drives. I know I'm not the sharpest tool in the box, but I usually have a good idea of the direction I'm supposed to hit the ball. We were so relieved to finish the round and get back to the clubhouse where one man and his dog were frequenting the establishment with their machine bought hot chocolate, Lovely !! 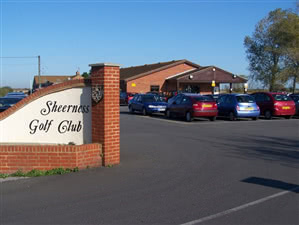 To sum up, Sheerness Golf Club is a typical links course and then some, not enough signage and a clear lack of direction made this game mindlessly tedious. If you're Mr. Boring, bringing along your chaps from the brain dead golf society, then you're gonna love it, otherwise, steer clear, you would have wasted your hard earned cash. We felt robbed, and we had a free fourball voucher that we had won at a previous competition. I bet that organiser laughed his head off when he knew we would have to use it at some stage, Oh Well ! !